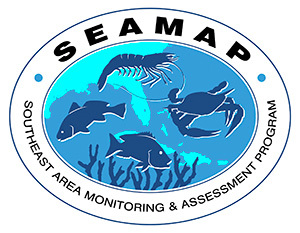 This is the third preliminary data summary for the 2002 SEAMAP Summer Shrimp/Groundfish Survey in the northern Gulf of Mexico. This week's summary includes sampling from June 17 through June 23 by the OREGON II, sampling from Texas vessels on June 17 and June 18, and sampling on June 26 from Alabama's A.E. VERRILL. Catch data from the A.E. VERRILL and OREGON II were taken with a 40-ft trawl. Catch data from the Texas vessels were taken with 20-ft trawls. Catch rates have been converted to pounds per hour for a 40-ft trawl. Shrimp counts are heads-off. Catch rates for finfish are given in the charts divided by 10; e.g., a charted catch rate of 19 means 190 lb/hr. The squares on the charts are 10-minute grids and contain an average catch or count from one or more sampling stations within a particular grid. The sampling stations were located randomly by depth zone. No shrimp were caught east of the Mississippi River during this sampling period. The highest finfish catch rate east of the River was 8 lb/hr reported in 20 fm at 29°46.8' W. lat. and 88°16.4' W. long., with no dominant finfish species. The catch data west of the Mississippi River indicated that the highest brown shrimp catch rate was 0.9 lb/hr of 89-count shrimp at 29°36.5' N. lat. and 93°44.4' W. long., in6 fm. The highest white shrimp catch rate was 0.6 lb/hr of 32-count shrimp at 29°42.5' N. lat. and 93°37.9' W. long., in 4 fm. No pink shrimp were caught west of the River during this sampling period. The highest finfish catch rate west of the River was 201 lb/hr reported in 5 fm at 29°37.6' W. lat. and 93°44.8' W. long., with Atlantic croaker being the dominant finfish species. The catch data for Texas indicated that the highest brown shrimp catch rate was 76 lb/hr of 78-count shrimp at 26°10.3' N. lat. and 97°00.5' W. long., in14 fm. The highest white shrimp catch rate was 35.9 lb/hr of 16-count shrimp at 27°40.2' N. lat. and 97°07.4' W. long., in 7 fm. The highest pink shrimp catch rate was 40.6 lb/hr of 48-count shrimp at 26°45.3' N. lat. and 97°16.2' W. long., in 10 fm. The highest finfish catch rate for Texas was 1,647 lb/hr reported in 12 fm at 26°19.9' W. lat. and 97°02.4' W. long., with spot being the dominant finfish species.